Chaos Boy spent Saturday afternoon at a friend’s place in Seaview and I headed out there late afternoon to fetch him. It wasn’t quite sunset time yet, but the sun was starting to head towards the horizon so I pulled over to snap this pic. I’m still trying to figure out the best setting on my DSLR to take sunset pictures but hopefully I’ll get there soon. 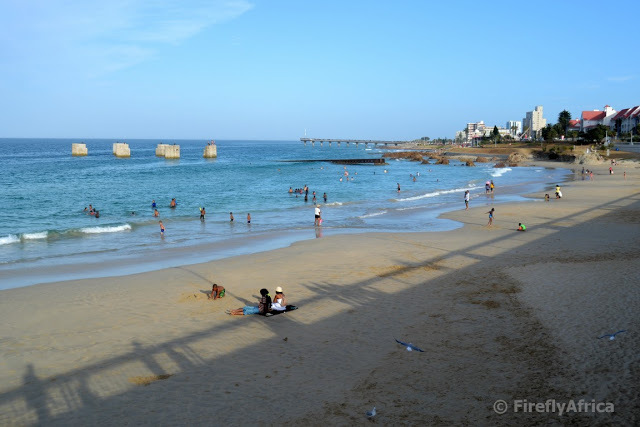 Humewood Beach is one of Port Elizabeth‘s flagship beaches and one that is popular with just about everybody. Being a Blue Flag Beach it has to adhere to international standards of safety and cleanliness and with the bridge overhead creating shade and nearby parking it’s a great family beach. But where did Humewood get it’s name from and has it always been popular beach? 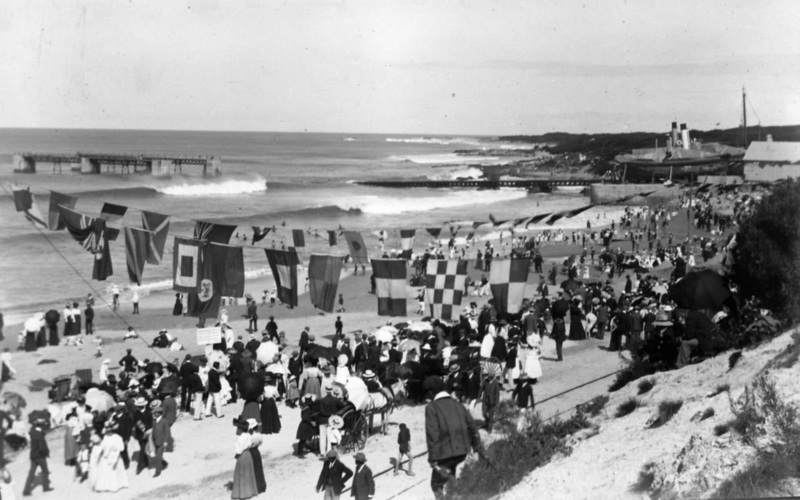 Humewood Beach obviously got it’s name from the suburb of Humewood which in turn was named after William Hume. Hume was born in Grahamstown in 1837 and died in Port Elizabeth in 1916. He was a member of the Harbour Board and the Legislative Council in Port Elizabeth and obviously was a person of fairly high standing in the town back then otherwise the area would never have been named after him. Another interesting fact I picked up is that part of Humewood around the Shark River (Happy Valley) used to be a farm called Gomery. 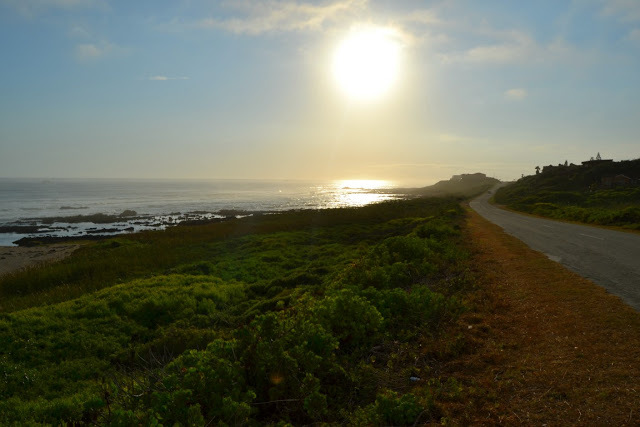 Now you also know where Gomery Avenue in Summerstrand got it’s name from. The popularity question you can judge for yourself by looking at the historic photos. 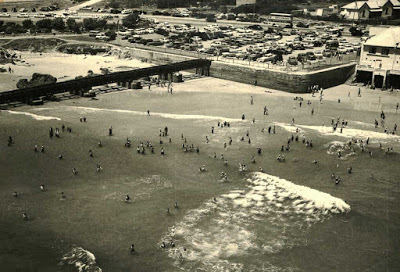 The pillars and old slipway you can still see at Humewood was built long before Port Elizabeth had a harbour. Construction on the Harbour Board Slipway started in 1899 and it was opened in 1903. The buildings were part of a small ship building and repair yard. Ships would sail between the six pillars to be steadied. A cradle was lowered underneath the ship which was then pulled onto the slipway by steam-driven hauling gear. The slipway was used until 1939. The little white building on the beach on the right was the ladies bathing house. As can be seen in this later picture, the slipway used to stretch all the way up to the old Humewood parking area. Today that area is the grassed section between Humewood and Hobie Beach. The big building in picture is the Bathing House which was opened in 1913. 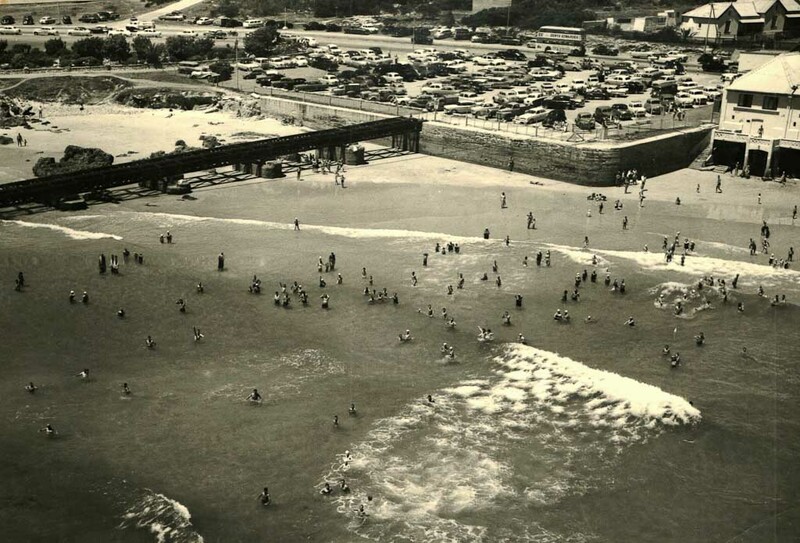 The building was built right on the beach with a foundation of reinforced concrete on rock and the waves washed up against the building at high tide. Bathers would pay to go inside and change into their costumes in their own private cubicles. The old ladies bathing house was removed when this building was built. 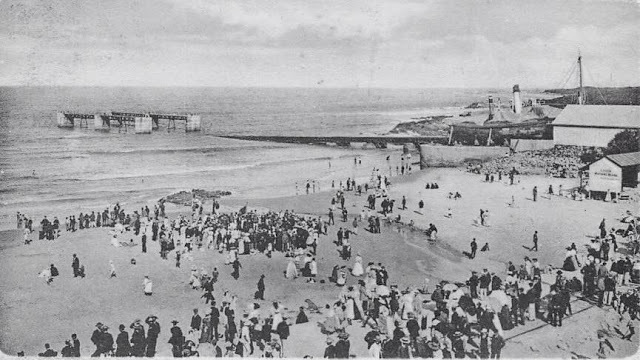 The Bathing House was demolished after the 1968 flood. Notice the road now on top of the railway line. Today the pillars are still there and so is the slipway, although a lot shorter than what it originally was. 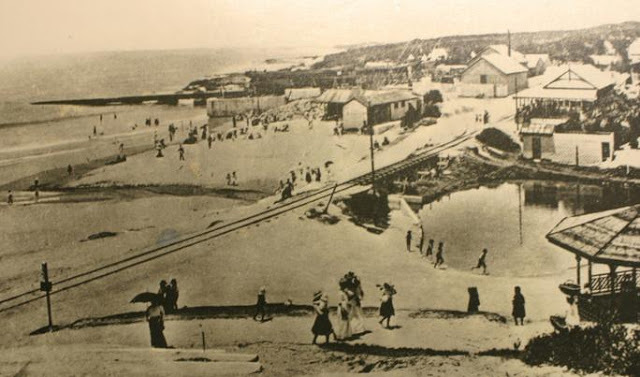 Shark Rock Pier at Hobie Beach is visible in the background and so are the Courtyard Hotel and Boardwalk on the right along with the Summerstrand beachfront buildings. The beach itself perhaps not as busy as normal as it was late afternoon and most people had headed home already. I sadly don’t know who to credit for the historic photos and have pulled most of them off albums on the Ex PE 60’s,70’s,80’s and The Friendly City of Port Elizabeth Facebook pages as well as nicked off the awesome Millers Local website. 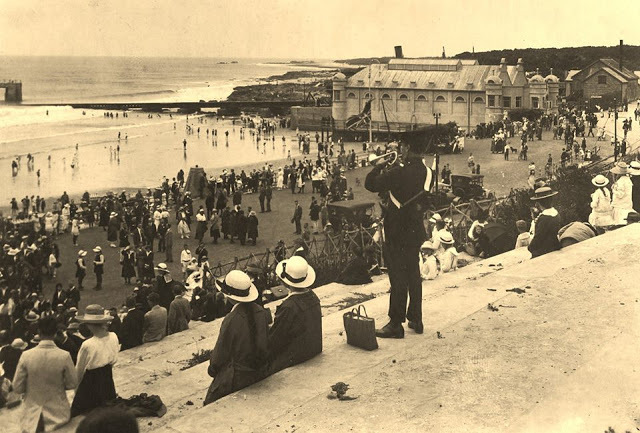 I got some of the info from Margaret Harradine’s Port Elizabeth – a social chronical to the end of 1945.